FULTON, NY – Oswego County Opportunities, one of the top 10 largest private employers in Oswego County, recently welcomed eight new staff members. To ensure the success of the new employees OCO provides a thorough orientation session that acclimates employees to the history, mission and vision of the agency. 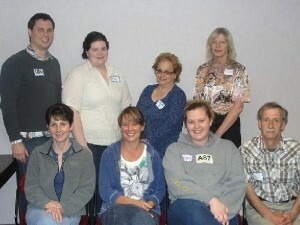 Pictured are new employees of OCO who recently completed the agency’s orientation program. Seated from left are Tammy Hastings, Becky Potter and Jessica Bartlett (Residential) and Martin Allen (Transportation). Standing from left are: Christopher Pang and Peggy Morton (Residential) and Christine Keffer and Deborah Somers (Youth and Family Services). Phillips added that each month OCO partners with its new hires to present a comprehensive orientation session that offers in-depth information on the structure, programming and history of the agency. “We have discussions about expectations, as well as, growth and training opportunities and how to pursue them. Our new hires also receive thorough training on mandated items such as HIPAA confidentiality, diversity and Right-to-Know. It’s a busy day that gives new hires the tools they need to build a successful career at OCO,” added Phillips. OCO offers more than 50 human service programs that serve more than 28,000 people each year. Operating in more than 80 locations throughout Oswego County, OCO’s workforce has more than 650 employees and 1,000 highly valued volunteers. A private, non-profit agency that is celebrating its 45th anniversary, OCO is committed to helping people, supporting communities, changing lives, and improving the quality of life for Oswego County residents. OCO is a United Way of Greater Oswego County member agency.